Saint John Baptist de la Salle, Priest - My Catholic Life! A cowboy mounts a horse and lassos a calf to show the next cowboy how to wrangle. A fisherman tosses a net into the ocean so that his son learns to put food on the table for dinner. And a good teacher teaches an apprentice how to teach. The passing on of professional knowledge doesn’t happen by accident. Those who are skilled teach those who are less so. 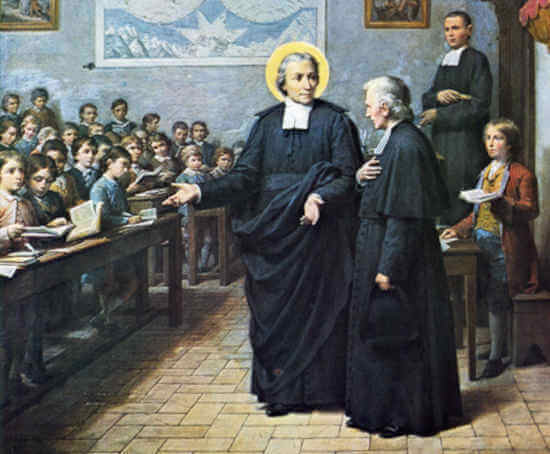 Today’s saint, John Baptiste de la Salle, was a lifelong educator, an excellent teacher who had innovative and effective ideas on how to educate youth. Most importantly, he also had faith, perseverance, and the administrative skills to bring his educational vision to fulfillment in the face of stiff resistance. A good teacher must do much more than master content. He must do much more than manage his classroom. A good teacher is an artist who combines mastery of the material with psychological insights, discipline, charm, preparedness, and love, all in careful equilibrium. At the time Saint Jean Baptiste began to teach teachers, the custom in France was to teach children Latin. And once they had learned Latin sufficiently, the custom was to teach the students every other subject in Latin. Lower class, poorer children, were often not taught at all or only for a few brief years. Jean Baptiste wanted all children to have access to a good education, for their schooling to be free of charge, and for classes to be in French. These ideals, combined with his own charm, holiness, and upper class savoir faire, drew many idealistic young men to his side. They wanted to be teachers too, and to dedicate themselves to the Lord. Originally Jean Baptiste was reluctant to live with, and train, men who belonged to a social class far below his own. He remarked that his first teacher trainees ranked below his own servants. In the end, though, Jean overcame his reluctance and innate prejudice and threw himself wholeheartedly into the educational work that would make him famous. So many young men gathered around him that Jean Baptiste founded an Order which was, after his death, officially recognized by the Church—the Christian Brothers. Just when his educational apostolates needed funds to expand, Jean Baptiste inherited a fortune from his parents. He was tempted to use the money to open new schools but instead donated it to the poor, deciding to rely only upon providence for the support of his schools. The members of his Order were intentionally not ordained to the Priesthood so that sacramental responsibilities would not distract them from teaching. His Christian Brothers also had no obligation to pray the Divine Office (the Breviary) and were prohibited from physical mortifications beyond the Church’s norms on fasting. Jean felt that teaching well was itself a mortification which required heroic self discipline. Jean wanted nothing less than ambassadors of Christ to the young, not just teachers. All of this was novel for its time—a body of men with no ordained members dedicated exclusively to education was unheard of. For all his successes in opening new schools, however, Jean Baptiste had numerous setbacks. Over many years he was verbally attacked, sued in court, and vilified by some religious Orders and clerics. They saw his free schools and universal educational goals as a threat to their own local monopolies on education. Jean Baptiste dealt with all of this with admirable courage, humility, and magnanimity. It’s not easy times that make one great. It’s hardship, adversity, and persecution. Jean Baptiste’s trials made a good man into a great man, and a great man into a saint. He fasted continually, mortified himself harshly, and traded his early life of comfort for hard scrabble poverty. After relinquishing the heavy burden of his Order’s leadership and administration, Jean was so obedient to his successor that the new superior joked that Jean would not die unless he was given permission to do so. The Counter-Reformation fervor behind so many great saints of sixteenth-century Italy and Spain arrived late to France, but it arrived no less ardent. Jean Baptiste was one of its greatest exemplars. The Christians Brothers peaked at over sixteen thousand members in the 1950s and are still active today in numerous countries, operating over a thousand educational institutions. The legacy of their dynamic, innovative, and indefatigable founder continues to thrive. 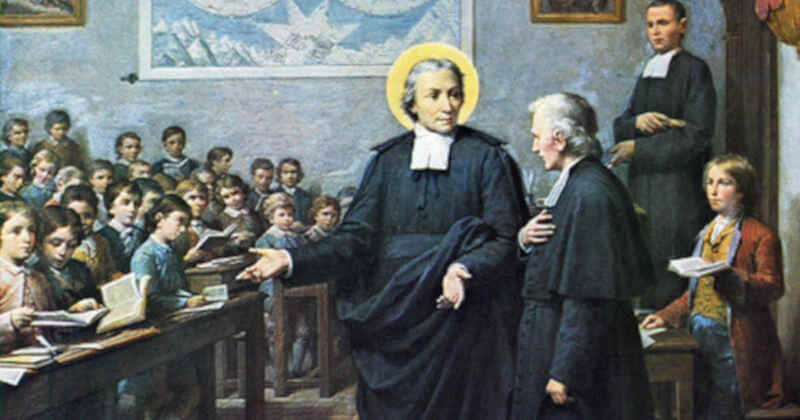 Saint John Baptiste de la Salle, through your intercession, give all teachers of the Faith the perseverance, grace, and love they need to teach the uneducated, especially the poor and those who struggle to learn. Your determination inspires. Your heavenly assistance guarantees fruitfulness.